In September, my first full-length collection of poetry, Solving the World's Problems, will be released by Press 53. I am very excited! And I've bought a bunch of new pens to...you know...umm...sign books and stuff. Would you like a personally signed book by me? 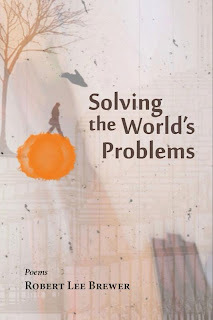 Order a copy by sending me an e-mail with the subject line: I Want Solving the World's Problems. Who knows? I might even slip a surprise thank you or two in there as well, though I hope the value of this collection is intrinsic, not extrinsic. Here's what former New Hampshire Poet Laureate Patricia Fargnoli, author of Duties of the Spirit and Then, Something had to say about the collection (an advance proof): "The 'World' in Robert Lee Brewer's Solving the World's Problems is a slippery world ... where chaos always hovers near, where we are (and should be) 'splashing around in dark puddles.' And one feels a bit dizzy reading these poems because (while always clear, always full of meaning) they come at reality slantwise so that nothing is quite the same and the reader comes away with a new way of looking at the ordinary objects and events of life. The poems are brim-full of surprises and delights, twists in the language, double-meanings of words, leaps of thought and imagination, interesting line-breaks. There are love and relationship poems, dream poems, poems of life in the modern world. And always the sense (as he writes) of 'pulling the world closer to me/leaves falling to the ground/birds flying south.' I read these once, twice with great enjoyment. I will go back to them often." Still not convinced? Wow! You're a tough customer. Good thing I've planned some hypothetical non-softball-questions ahead of time with totally-unplanned-off-the-cuff answers at the ready. Why would I lay down my hard-earned money for your book? Or if you need another reason: Because you want to be a part of history, since this is the first full-length collection of poems from the Robert Lee Brewer. You can say you were there in the beginning, and that'll make you really cool in a "I was there in the beginning" kind of way. Or if you need another reason: Because I begged and pleaded with you, and it's better than dropping the same amount of money on whatever it is that you spend money on that you usually regret later as a bad purchase. I ain't too proud to beg. Is this book really going to solve the world's problems? Hmm... Good question. You're pretty sharp. Sharp like a knife. Or sharp like the teeth of a shark. You know I think you'll find the answer you want to find by purchasing a copy of the book and reading it yourself. But now that it's out there, I'm pretty sure of one thing: It will drive you crazy not knowing. So spare yourself the sleepless nights and read the book. You can thank me later. I know Patricia Fargnoli said nice things about Solving the World's Problems, but does anyone else have anything nice to say about the collection? I mean, besides your mom. Well, I do have a really nice quote from my mom, but I'll save that for another blog post, I guess. Since I can't use her endorsement, I'll use this one from one of my favorite contemporary poets Sandra Beasley, author of I Was the Jukebox and Theories of Falling: "Rather than solving the world's problems, this collection turns them to the sun like a prism--casting bright and spare images of humanity in flux. 'We spill ourselves all over ourselves,' one poem observes, 'our excess light / our forgiving natures.' Compassionate, challenging, and filled with slinky swerves of phrase, these poems refresh how we look at our daily lives." Any other non-mom niceties coming your way? Yes, this is what Scott Owens, author of Something Knows the Moment, had to say: "These poems illustrate the vitality of poetry in our daily lives. Diverse, refreshing, even at times startling, these poems make bold claims for poetry." Okay, okay. How do I purchase this amazing book? That's the easy part. Just send me an e-mail at robertleebrewer@gmail.com with the subject line: I want Solving the World's Problems. Then, we'll work together to get the book in your hands. It costs $15 (shipping included), and I can accept check, money order, or PayPal. And you'll get a signed and dated copy to prove you were there in the beginning. Plus, I think the poems are pretty darn good. Click here to read a few sample poems. By the way, if you'd rather go through my publisher, that's a great option too. As with getting copies from me, the pre-order event is only valid through August 1. Click here to learn more. 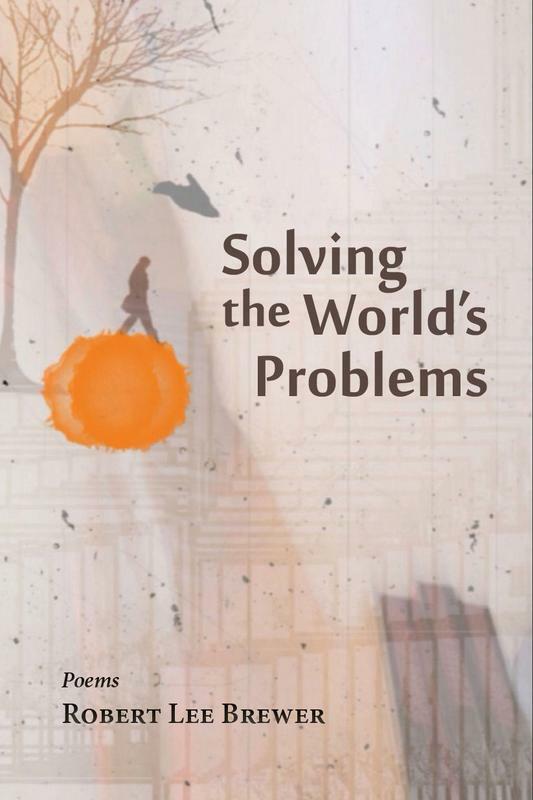 My debut full-length collection of poetry Solving the World's Problems is due from Press 53 on September 1, 2013. It's been an exciting highlight to the year for me, and I can't wait to hold a copy in my hands. If you're interested in getting your hands on a signed copy, send me an e-mail at robertleebrewer@gmail.com to get the wheels in motion--or order a copy here. The poems in this collection represent what I consider my best up to now, and many of them have gone through a major transformation since the collection was accepted for publication. I have my wonderful editor Tom Lombardo to thank for helping guide this collection in a new (and I think better) direction. Anyway, this post shares a few sample poems from Solving the World's Problems. As we run up to the release date for the collection, I'll be sharing more information, including various events--both online and in person. If you're interested in either having me read at your venue or doing some kind of interview or review, just send me an e-mail at robertleebrewer@gmail.com. To get a signed copy, send me an e-mail as well, or click here to order a copy directly from Press 53. Solving the World's Problems, by Robert Lee Brewer. Finding Success as a Poet.